Not to be confused with Glycan. 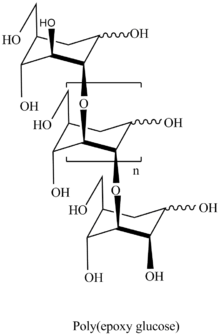 A glucan molecule is a polysaccharide of D-glucose monomers, linked by glycosidic bonds. Many beta-glucans are medically important. They represent a drug target for antifungal medications of the echinocandin class. Properties of Glucans include resistance to oral acids/enzyme and water insolubility.Glucans extracted from grains tend to be both soluble and insoluble. Glucans are polysaccharides of glucose monomers linked by glycosidic bonds. Accordingly, polymers built up of carbohydrate units bound by bonds other than glycosodic bonds are not considered polysaccharides. 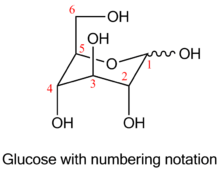 Only four different types glucose-based polysaccharides are possible to be built: 1,6- (starch), 1,4- (cellulose), 1,3- (laminarin) and 1,2-bonded glucans. 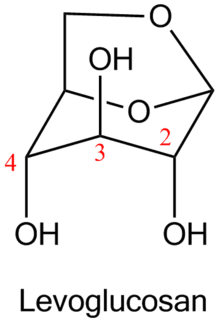 Levoglucosan is 1,6-anhydro derivative of glucose. It is one of the key products in thermal conversion of polysaccharides. Polysaccharides are not volatile at combustion temperatures; propagation of fire takes place due to combustion of volatile products of degradation of polysaccharides, mainly levoglucosan. 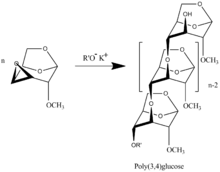 The first representatives of main chain unhydrolysable linear polymers made up of levoglucosan units were synthesized in 1985 by anionic polymerization of 2,3-epoxy derivatives of levoglucosan (1,6;2,3-dianhydro-4-O-alkyl-β-D-mannopyranoses). A wide range of unique monomers with different radical R can be synthesized. There were synthesized polymers with R= -CH3, -CH2CHCH2, and -CH2C6H5. Investigation of the polymerization kinetics of those derivatives, molecular weight and molecular-weight distribution showed that the polymerization has the features of a living polymerization system. The process takes place without termination and transfer of the polymer chain with a degree of polymerization equal to the mole ratio of the monomer to the initiator. Accordingly, the upper value molecular weight polymer determines only degree of purification system what determine the presence in the system uncontrollable amount of terminators of polymer chains. Poly(2-3)-D-glucose was synthesized proceeds by transformation of benzyl (R= -CH2C6H5) functionalized polymer. Polymerization of 3,4-epoxy levoglucosan (1,6;3,4-dianhydro-2-O-alkyl-β-D-galactopyranose)  results in formation 3,4-bounded levoglucosan polymer. The presence of 1,6-anhydro structure in every unit of polymer chains allows to apply all spectra of well developed methods of carbohydrate chemistry with formation of highly intriguing biological application polymers. The polymers are the only known regular polyethers built up of carbohydrate units in main polymer chain. ↑ Carlson, LJ (November 1965). "Preparation of 2- and 4-Substituted D-Glucose Derivatives from 1,6-Anhydro-β-D- glucopyranose". 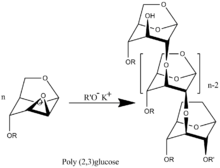 The Journal of Organic Chemistry. 30 (11): 3953–3955. doi:10.1021/jo01022a517.